Preheat oven to 375 degrees . In a large bowl, whisk together 1/2 cup sugar, the lemon zest, lemon juice, nutmeg and salt. 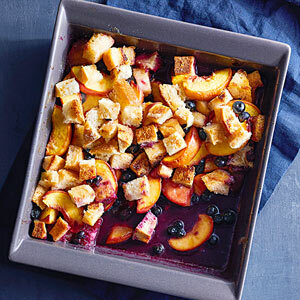 Add peaches and blueberries; stir to combine. Add 2 cups bread cubes; toss to coat. Transfer fruit and bread mixture to a 2-quart baking dish. Drizzle with 1/4 cup melted butter. Top with remaining 2 cups bread cubes. Drizzle remaining 1/4 cup melted butter over bread cubes. Sprinkle evenly with remaining 2 tablespoons sugar. Cover tightly with foil. Bake for 30 minutes. Remove foil and continue baking about 20 minutes longer, until fruit is bubbling and top is crisp and golden brown. Let stand at least 20 minutes, then serve warm with ice cream or whipped cream, if desired.